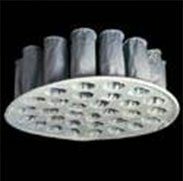 AFF has manufactured fluid bed dryer bags for the chemical, pharmaceutical and food processing industries for the last 20 years. We carry a wide variety of conductive and non-conductive materials to fit any application. All of our bags are manufactured in strict compliance with pharmaceutical standards to ensure durability, cleanliness, performance and fit. We manufacture bags to fit all OEM’s including Glatt, Niro-Aeromatic, Fluid-Air, Vector and Fitzpatrick. Send us a drawing, sketch or Cad of your current bag and we will manufacture a proper fitting replacement. 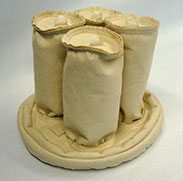 AFF manufactures a wide range of fluid bed dryer bags for the pharmaceutical industry. We utilize conductive and non-conductive lint free materials. All bags are inspected and tagged prior to shipping to avoid cross contamination and provide traceability. We can manufacture any style or shape and will provide significant savings over OEM bags. 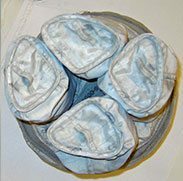 AFF, now stocks anti-static versions of our nonwoven polyester felts and woven polyester satin material that is used in fluid bed dryer filters. Both materials feature a stainless steel scrim in a checker board pattern which along with a ground wire in the seam dissipates static thought the entire filter. Our new antistatic materials are just another great addition to the wide range of filter media that AFF has readily available to address your specific dust types and provide you with the best possible filtration.